See more of this Barnwood Furniture. Having a number of drawers and doors will make our barnwood Kitchen Island perfect for additional storage space and all your kitchen accessories. Reclaimed Red Oak planks, from tobacco barns built in the 1800s, are used in constructing this barnwood Kitchen Island. The dull catalyzed lacquer finish is extra durable and retains the wood's character. Topped with a laminate countertop that brings everything together, this reclaimed oak kitchen island is 60” in length by 36” in width and features a height of 36”, making it a perfect fit for most rustic kitchens; however, upon request, we can customize something specific. The perfect addition to your rustic home décor, this modest barnwood kitchen island provides essential storage space and artisanal beauty. 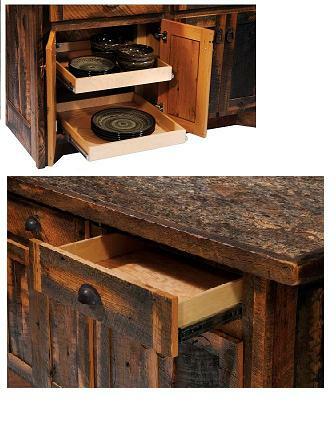 The first inset image shows the inside of the island, the second shows the artisan top, and the third shows a close-up of the slide out cabinets and of the laminate top. 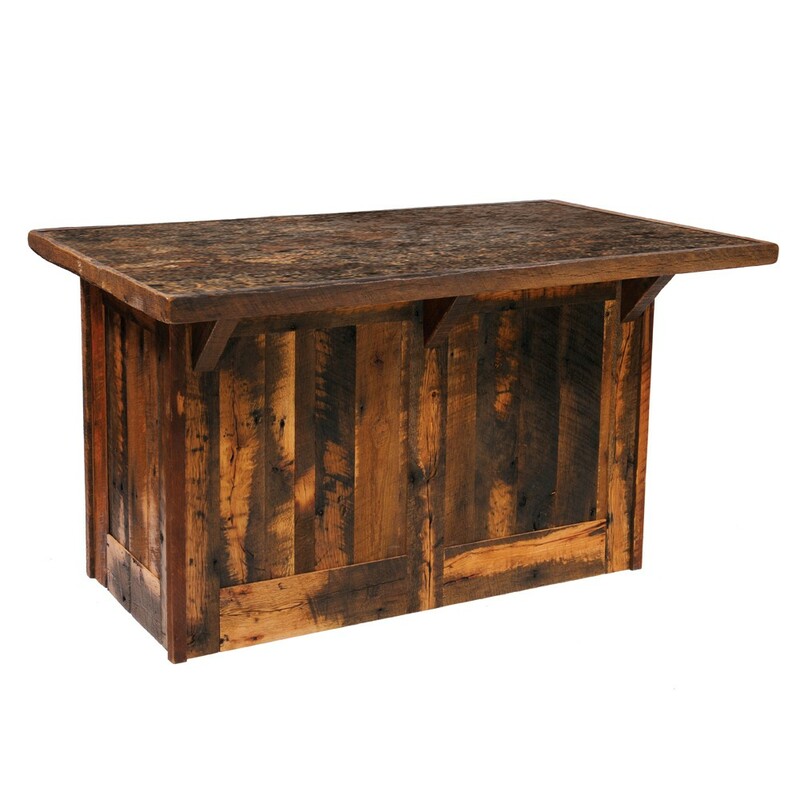 Reclaimed Red Oak planks, from tobacco barns built in the 1800's, are used in constructing this Barnwood Kitchen Island. Dull catalyzed lacquer finish is extra durable and retains the wood's character. The drawers & doors give you that extra needed storage space. 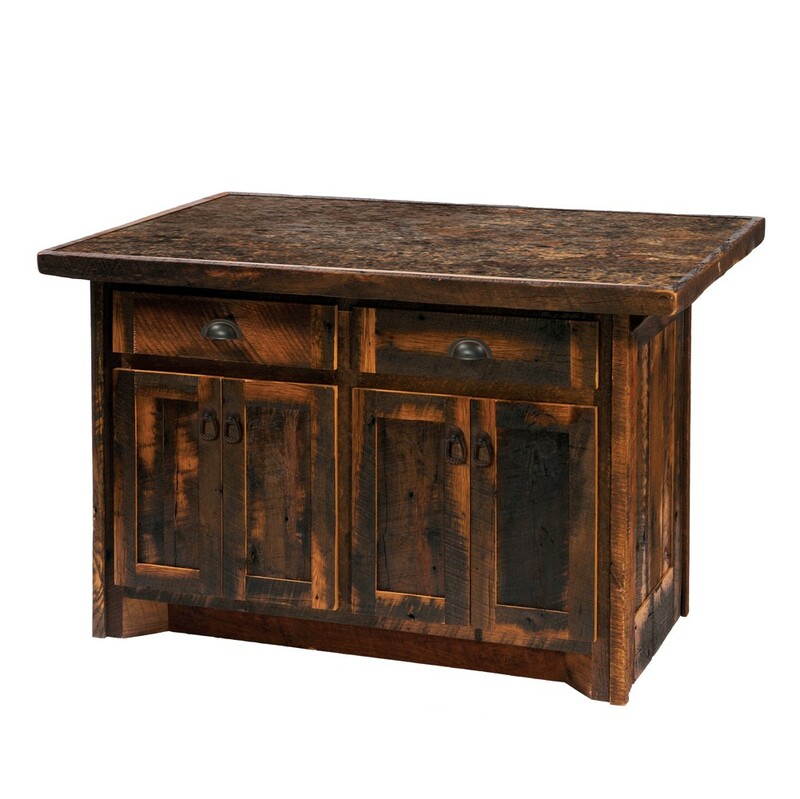 This Barnwood Kitchen Island is 60"W x36"D x 36"H, custom sizes are available. Call for a quote. Pay half now & half later with no sales tax! (Balance due upon shipment.) Estimated shipping: 3-8 weeks. Most of our Barnwood Furniture ships via Motor Freight. 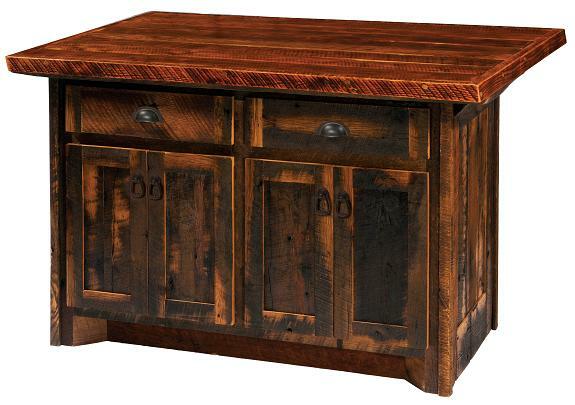 Free Shipping on Fireside Lodge Barnwood furniture orders over $1500, in the contiguous 48 states. Orders under $1500 for Fireside Lodge, please add $150 per order for shipping. Please call for quotes to Hawaii, Alaska and Canada. See Barnwood Furniture Shipping for more details. Currently no video is available for this barnwood furniture collection.